No matter where you work, what you do, where you do it or who you do it for, keeping track of your time off is important. 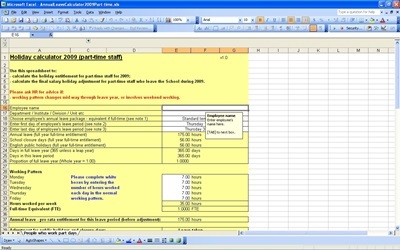 With this annual leave calculator template from Microsoft Excel featured on this page, keeping track of your used and unused leave time is simple. Try it today to see for yourself! The annual leave calculator can be downloaded right here instantly at absolutely no charge. This customizable annual leave calculator template provides room for you to enter your time off, the amount of leave you have earned, and the dates you are taking leave. If you need to add more information, simply adjust this annual leave calculator to fit your needs. The template will calculate how much leave you have left unused, so you always know how much time off you have left for the year. If you work in a school, you’ll find our annual leave calculator especially helpful, as it includes space to count the number of school holidays you have off from work, in order to fully understand your time off throughout the year. You can enter your amount of earned time off, as well, and the annual leave calculator can help you get a true picture of the time off you have throughout the year. This template is a great way to track your time off in one convenient place instead of looking at pay stubs or keeping a record by hand. Download this annual leave calculator today to see how much it can simplify your life. This is far from the only helpful template, spreadsheet or calculator on our site! We have thousands of others that will help you organize your life. Just take a moment to look around our site and see for yourself.